Food costs are 25--35% of every dollar of food sales, according to recent industry stats. Jonathan Benno and Ben Cianciosi, his Chef de Cuisine at Leonelli Restaurants, share food costing insights, beyond the basics, for decision makers of the restaurant team. How Does Food Costing Impact New Restaurants? A new restaurant does not immediately have a profit margin or a backlog history of the pricing of goods to more accurately forecast the variance between the expected cost and the actual cost of inventory. Therefore, it’s very important to monitor and adjust this cost variance early on to ensure that the budget allocated to the expected cost remains an accurate and reliable figure for food costing and budget forecasting. To phrase it less dryly: It’s imperative that close attention is paid to food costs -- among other costs -- to be sure that the money being spent remains in-line with the opening budget. Are All Restaurants Affected Equally? As a general rule, casual restaurants will operate with a lower food cost compared to fine dining. Casual restaurants typically have an inventory composed of product that requires less demanding preparation (which also means lower labor costs). Speaking of Labor... How Does It Factor In? There are two costs that a restaurant team has the most control over; food and labor. If the cost of labor rises, menu prices do not necessarily need to be raised dramatically. Firstly, a restaurant will not be able to rely on overtime labor as much as in the past. Instead, a greater emphasis should be placed on training. A well-trained hire will provide more efficient labor. Salaried employees will also have a greater responsibility helping to accomplish tasks that may otherwise have demanded more time from an hourly employee. Where is the magic line between food quality vs. cost? The “magic line” is found by determining the selling price. If the price for a beautiful Prime ribeye with morels that needs to have a 25% food cost works out to be $45, then you need to assess if that price aligns with the rest of your menu and the spending habits of your guests. If it’s too high, then another cut of beef or different garnish may be a wiser alternative. At Leonelli Restaurants (within the Evelyn Hotel), we will have three different kitchens operating alongside one another, each with their own set of costs. For the bakery, dairy, chocolate and nuts will likely cost the most. For the Taberna, meat, seafood and dairy. The fine dining kitchen will have the greatest food cost, utilizing luxury ingredients in addition to meat, seafood and dairy. Sustainability goes hand-in-hand with operating a restaurant intelligently. For instance, let’s look to whole animal butchery. If you want to have pork chops on the menu, it would be more expensive and less sustainable to order a bone-in pork loin and then portion that into chops in the restaurant than it would be to buy a whole hog. The pork chops that come off the hog can be priced fairly and still cover the initial cost of the animal. Every other preparation made from the legs, belly, head, etcetera is profit. Not only it is a cost savings, it’s also sustainable! “Going Local” is almost always the most responsible option for product purchases. While purchasing directly from farmers entails a greatly reduced carbon footprint, it may still not be cheaper than product that’s intensively farmed, packaged and shipped from outside the state. There’s a happy medium to be struck when ordering between beautiful premium produce/meat from local, conscientious farmers (e.g., peak season Jersey corn, pasture raised pork) and bulk workhorse items (e.g., onions, carrots and chicken bones for stock). 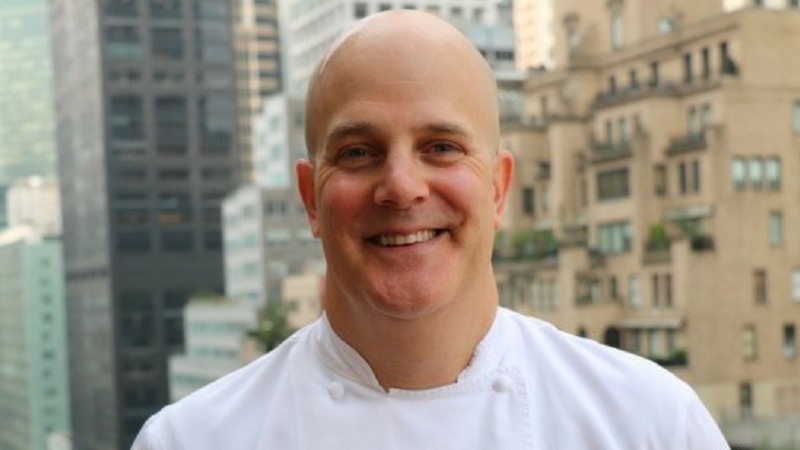 Considered one of the top chefs in the country, and recognized for his dedication to quality and craftsmanship, Jonathan Benno’s career spans more than three decades, having worked in some of the world’s finest restaurants. A graduate of the Culinary Institute of America, the spirit of his cuisine has been cultivated through his mentors including John Farnsworth, Michael Mina, Daniel Boulud, Tom Colicchio, and Thomas Keller, who helped shape his philosophy about food and dining, and instill in him the drive to settle for nothing less than excellence. Benno spent six years as the Chef de Cuisine of Per Se, during which time he helped earn the restaurant three Michelin stars and four stars from the New York Times, and was named a Food & Wine Magazine “Best New Chef.” Most recently, Chef Benno spent six years at the helm of Lincoln Center’s Lincoln Ristorante, where he gained critical acclaim for his contemporary Italian Cuisine. projects represent the culmination of Chef Benno’s life-long dedication to the hospitality profession.